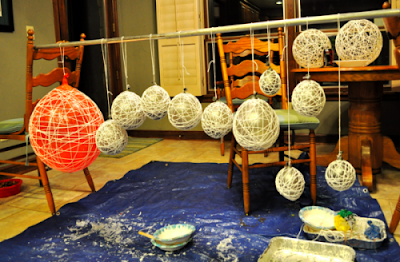 A perfect fit for the DIY bride, check out these DIY yarn ball chandeliers. They are beautiful in white or make a more bold impact by choosing more vibrant colors. They are also extremely easy easy to make! 1. 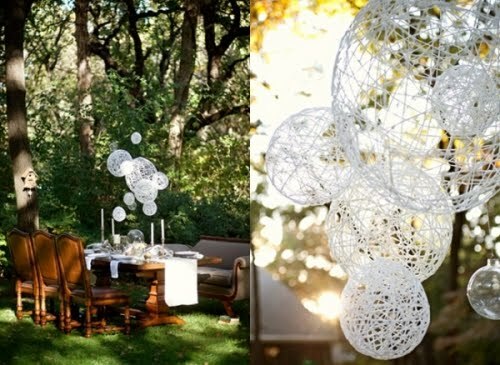 Blow up balloons to the sizes you prefer. It's better if they range in size. 2. 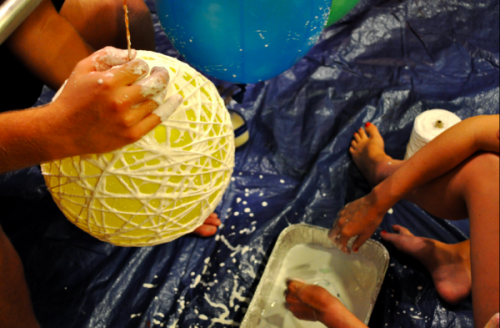 You'll need to have corn starch, glue (white or clear) and warm water on hand. Mix them all together to create a paste. You've mixed it enough when it becomes a smooth texture. 3. Take Vaseline and rub over the entire balloon. This ensures the paste will not stick to the balloon when it's dry. 4. Run the yarn through the paste and wrap around the balloon, keep repeating until the balloon is covered to your liking. Remember to change directions constantly to keep it interesting. 5. The hardest part of this DIY project is waiting until it's dry completely. You'll need to wait at least 24 hours. After it's dry, pop the balloon. 6. The last step is important. Remember to spray your yarn ball with CLEAR fast drying spray paint.